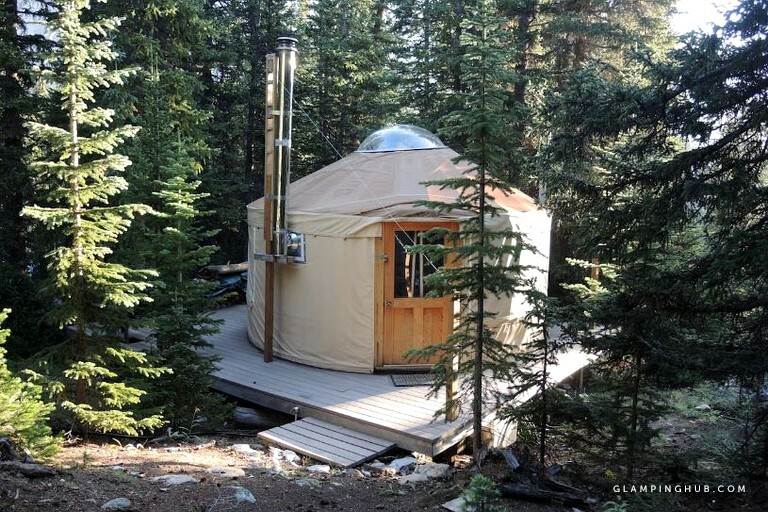 For those who are looking for a unique rental for their upcoming vacation, this cozy yurt nestled in the Colorado wilderness near resorts like Breckenridge and Vail is a dream accommodation! 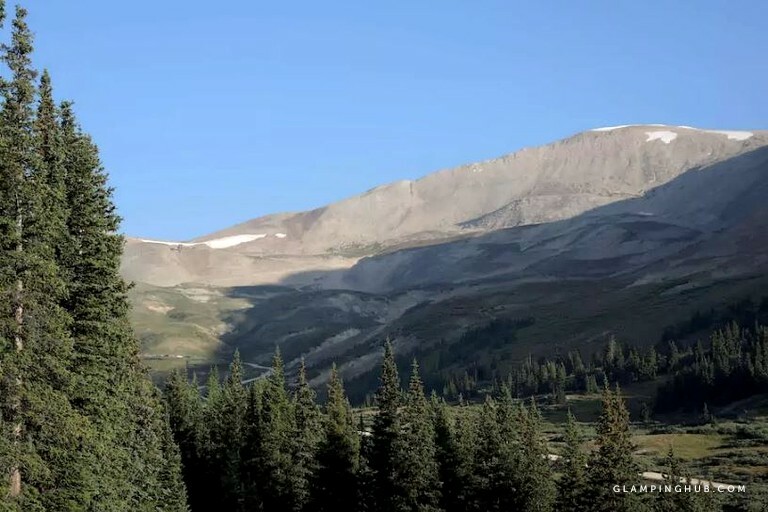 It boasts fantastic views of surrounding mountain peaks and amazing access to hiking trails and national forests. 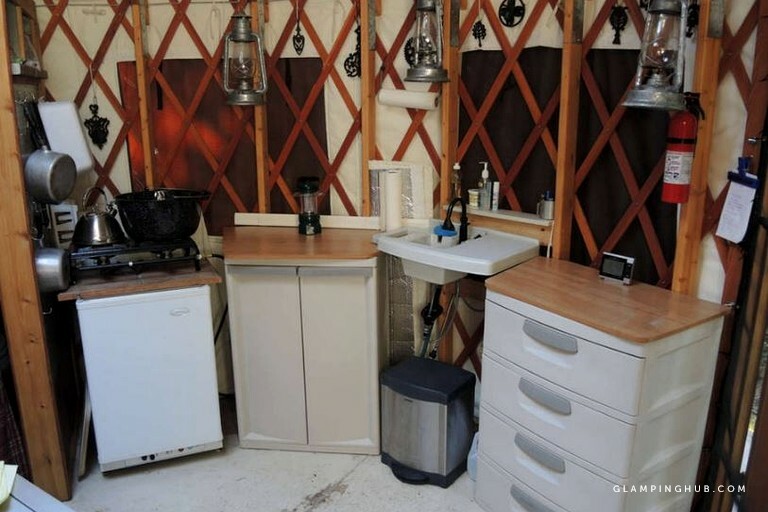 This yurt can accommodate up to six guests and consists of one large room. There are two single bunk bed sets with storage space below, as well as two additional single folding cots. 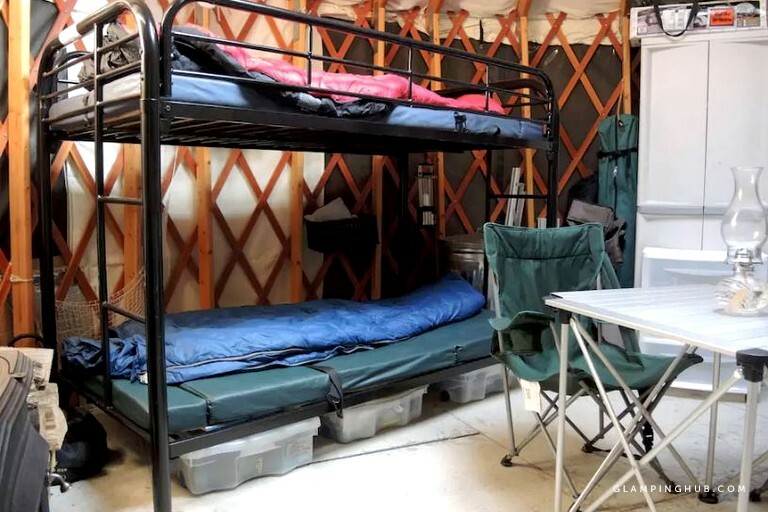 The owners supply two sleeping bags and blankets for guests during their stay. The yurt is equipped with collapsible tables and chairs so guests can make the most of their space. 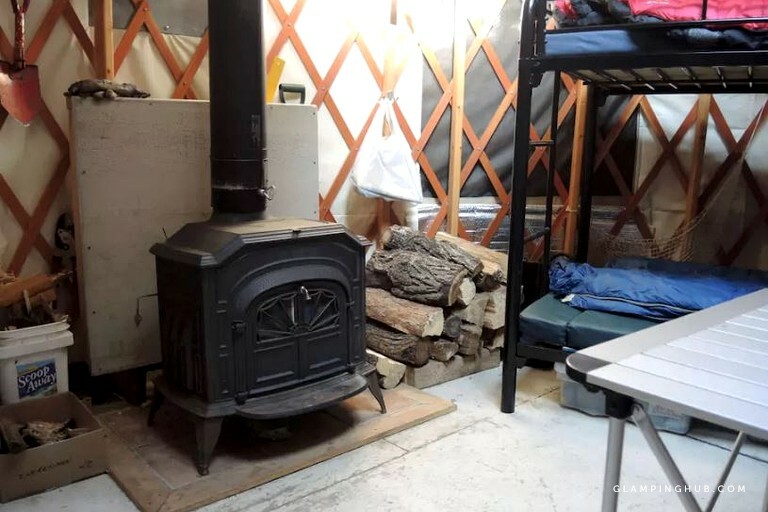 a wood-burning stove in located inside of the yurt, so guests can warm up next to the crackling fire after a long day of skiing. The kitchen area includes a stove and a refrigerator that runs on propane, as well as necessary utensils, cutlery, and dishes that guests would need to complete a meal. Bathroom facilities can be found inside of the yurt and include a sink, a composting toilet, and a solar powered shower. Guests are encouraged to read the manuals for each appliance before use. This property is equipped with all of the comforts and luxuries that glampers look for in a unique glamping experience. It is fitted with eco facilities like a composting toilet, a solar shower, and propane appliances. There is a full camping kitchen where guests can prepare meals for themselves throughout their stay. For heating, there is a wood-burning stove inside which guests can use in the case of dropping temperatures. Guests are supplied with two sleeping bags, assorted blankets, and hiking backpacks with water containers throughout their stay. When guests step outside the yurt, they can enjoy the use of the deck with outdoor furniture that has amazing views of the surrounding mountainscapes. Outside, there is also an outdoor fireplace where guests can warm their feet and an outdoor barbecue grill where guests can prepare a nice dinner under the stars. 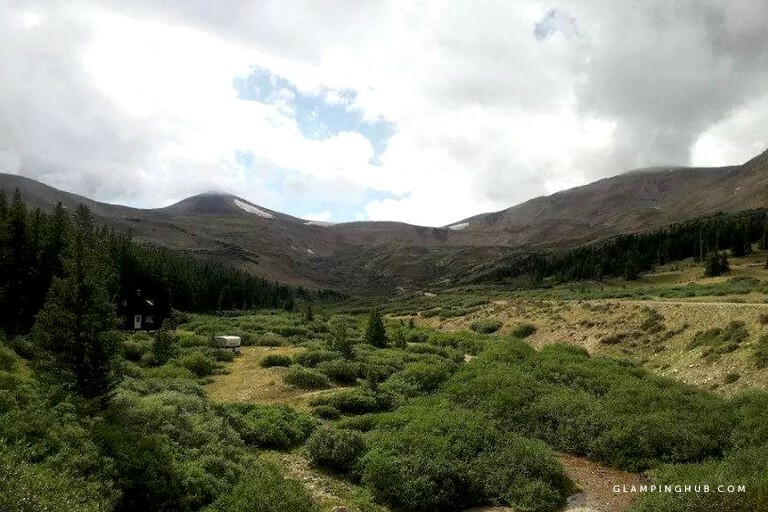 Located in the heart of the Colorado wilderness, this property can be found in the small town of Fairplay in central Colorado. 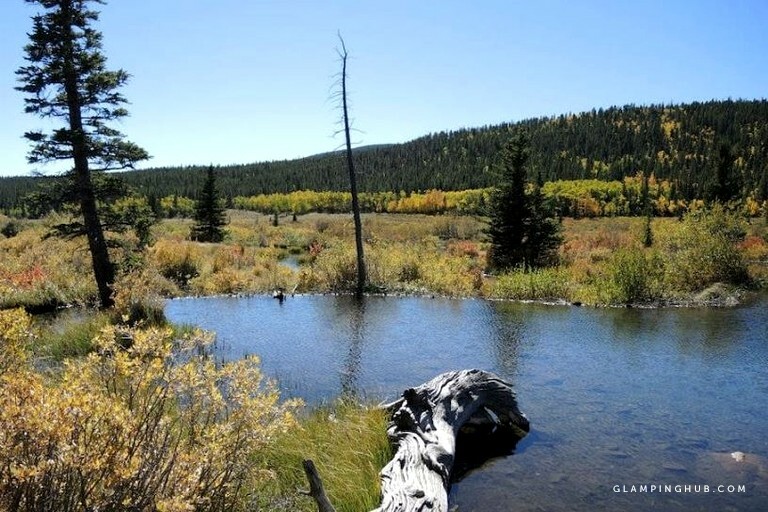 Equidistant from both Colorado Springs and Denver, this property lies about two hours to the west of both cities. 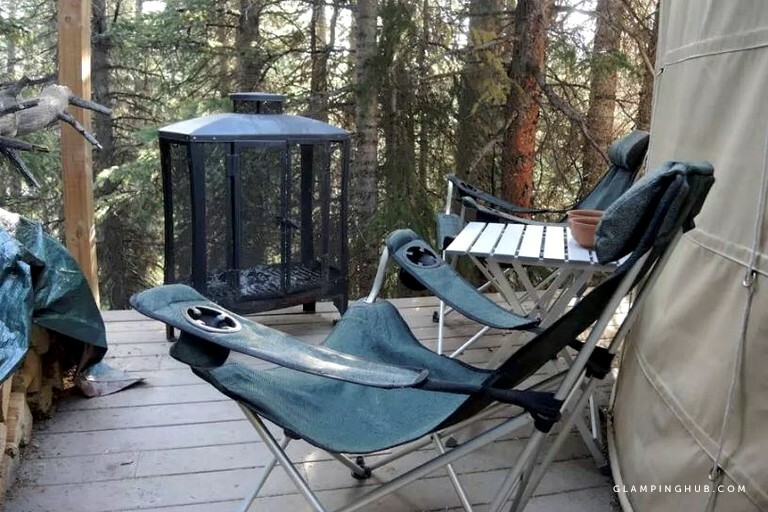 Surrounded by mountains and forests alike, this property has great access to hiking trails, ski slopes, rushing rivers, and tranquil lakes. 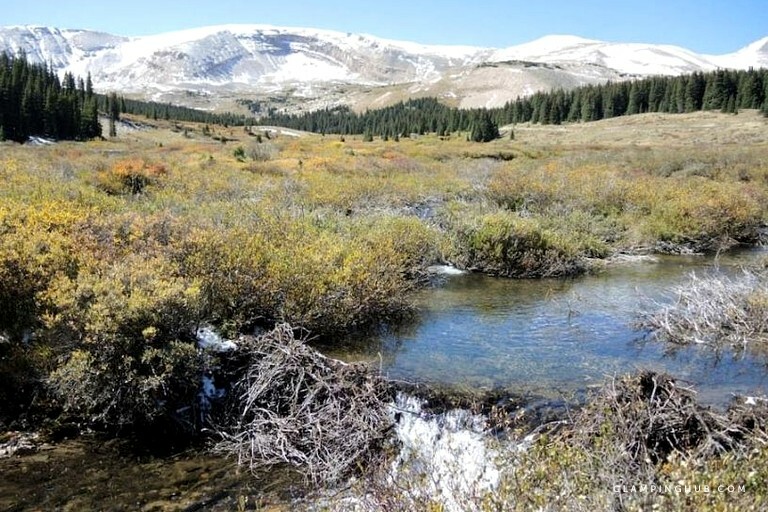 Famous ski resorts like Breckenridge and Vail are just a car drive away to the north. 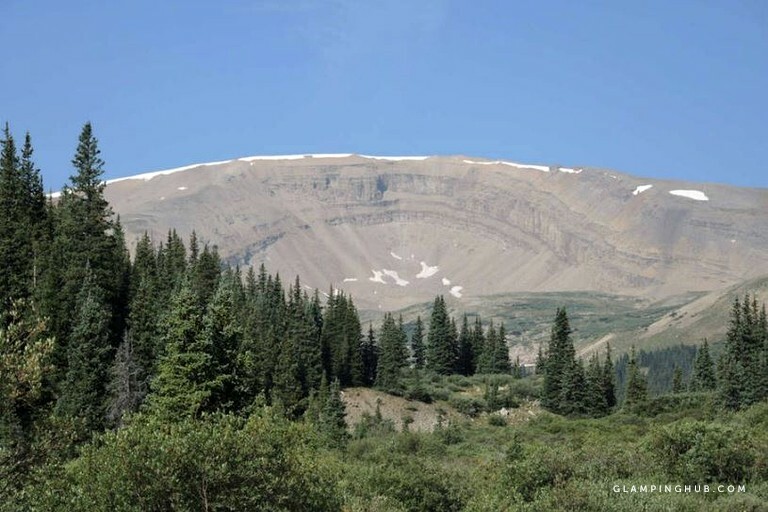 The Colorado wilderness is an amazing location for glampers who want to take advantage of the open alpine air and the endless mountain landscapes. Throughout the year, visitors have the chance to explore the natural surroundings as well as the local wildlife. Animals such as deer, bears, and moose are known to roam the area, so nature enthusiasts shouldn't forget their cameras at home! Due to the close proximity to the mountains, there is something to do outdoors during every season. 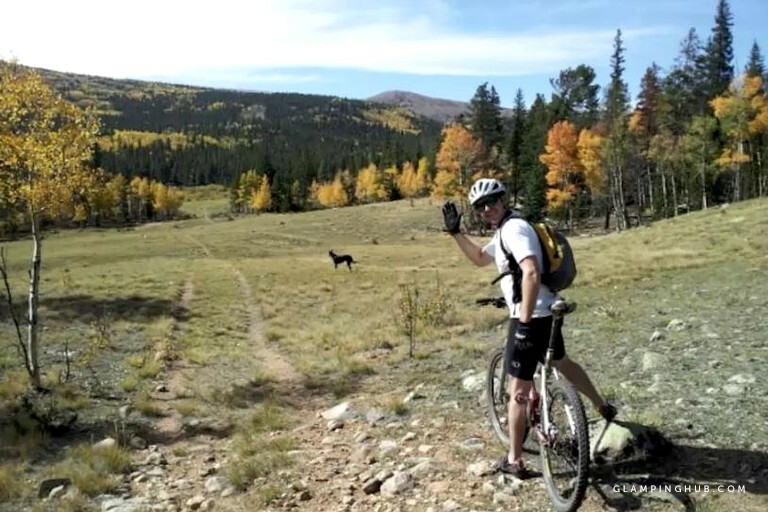 During warm weather months, hiking, mountain biking, mountain climbing, trekking, horseback riding, and hunting are popular activities that attract visitors and locals from all around. The winter months are famous for winter sports in the area when ski resorts open their doors for skiers and snowboarders. Flat terrain nearby is great for cross-country skiing, snowshoeing, and riding snowmobiles. Water sports are also a popular pastime in the summer months, and there are many nearby rivers and lakes that glampers can visit. Swimming, kayaking, canoeing, boating, rafting, and fishing are all accessible close to the property so guests can take advantage of cooling off outside. If guests want a break from the wilderness, they can take a day trip to the cities of Colorado Springs and Denver, which both boast great local gastronomy, breweries, shopping, museums, and historical monuments. Glampers can take tours and learn more about the local history! This property is pet-friendly. 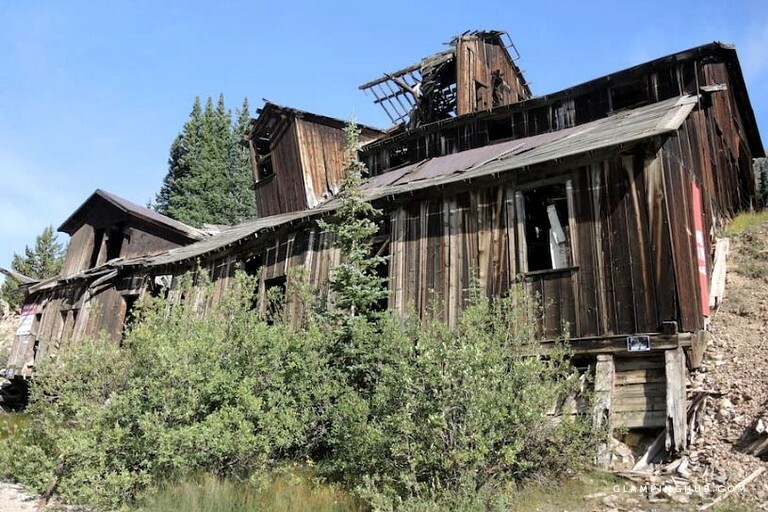 There is no cell phone or internet service at this property. Since the bathroom and cooking facilities are different to what glampers would find at home, the host encourages the guests to read all manuals before using the facilities. It is strongly advised to not start a fire on the forest floor. When lighting the fireplace and grill use caution. If there is a fire ban in the region, under no circumstances should a fire be lit outside. 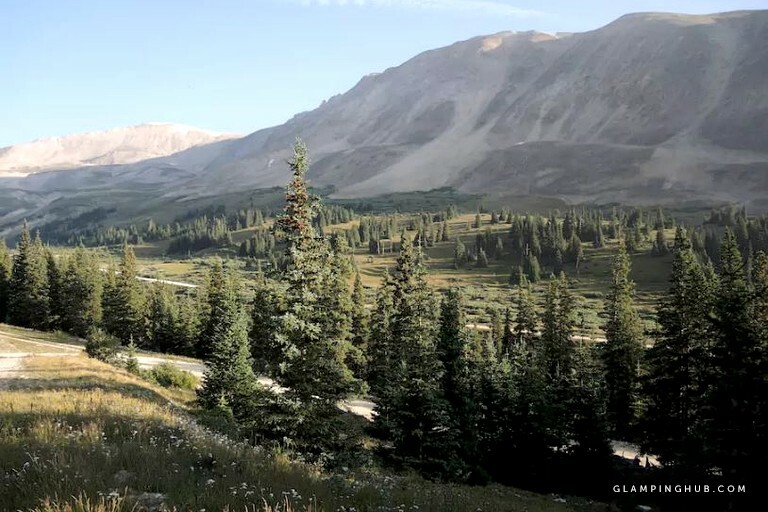 The property is located 14 miles from the highway and depending on the season the dirt roadway can be quite rugged so use caution when approaching. Littering is forbidden at this property.